We have all heard of Nigella Lawson, the British cooking show goddess who advocates the importance of a well-stocked pantry, and it appears from a few of her recipes that her pantry includes nigella seeds. But these seeds had the name first. In fact, they have a whole bunch of names, some of them misleading: onion seeds, black cumin, charnushka and kalonji, to name a few. Although they resemble onion seeds or black sesame seeds, they are actually the seeds of Nigella sativa, a simple annual flowering plant. Nigella sativa is an annual flowering plant that grows to 20 to 30cm (8 to 12in) tall, is native to Asia and the Middle East. The flowers of this plant are very delicate and have five petals about 2.5cm (1in) wide, usually white they are occasionally tinted with pale blue veins and appear between June and September. They yield a seed capsule with five compartments each topped by a spike. The compartments open when dried to disperse the seeds. The seeds are small, matte-black grains with a rough surface and an oily white interior. They are roughly triangulate, 2mm in length and look similar to onion seeds. The seeds have little bouquet, though when they are rubbed they give off an herbaceous aroma that is reminiscent of oregano. The black seeds are used as a spice, slightly bitter and peppery with a crunchy texture, the seeds may be used whole or ground, they are easily crushed in a mortar and pestle. They are usually fried or roasted before use, like many other spices, nigella develops its flavour best after short toasting in a hot dry pan, or short frying in a little oil. They have a spicy, nutty flavour and can be sprinkled whole or ground up on food, and the oil can also be used on salads and other dishes. Nigella seeds are used in India and the Middle East as a spice and condiment and occasionally in Europe as both a pepper substitute and a spice. They are widely used in Indian cuisines, particularly in mildly braised lamb dishes such as korma. It is also added to vegetable and dhal dishes as well as in chutneys. Nigella is an ingredient of some garam masalas and is one of the five spices in panch phoran. Panch phoran is used both for meats and vegetables. The composition mostly given in the literature is whole nigella, fenugreek, cumin, black mustard seeds and fennel at equal parts. Bread seems to be a cross-cultural use for nigella seeds, in asia they are sprinkled on to naan bread before baking, used to top flatbreads in Turkey and in Eastern Europe are sprinkled on Jewish rye bread in place of caraway seeds. In the Middle East nigella seeds are added to bread dough. Peshawari naan is, as a rule, topped with Nigella seeds. The seeds can also be ground and added to water to create a gel. This gel is incredibly useful, it can be used as an egg replacement in gluten-free and flour-free baking. Sowing: Sow in spring through summer and in autumn. 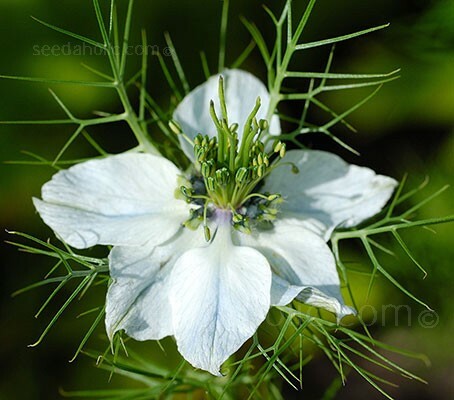 For continuous seed production it is best to sow Nigella sativa seeds successionally. Sow once a month from just before the last frost of spring until late summer, and then once again towards the end of autumn for earlier crops in spring, this will result in a prolonged blooming period. Nigella seeds can be sown indoors early in the year for transplanting to the garden once temperatures rise in spring. They can be sown directly where they are to grow in spring through to autumn. Ideally Nigella should be grown in a sunny part of the garden that has good drainage. They prefer well drained soil enriched with manure or compost ahead of planting, but will grow in most sites and soils and can be grown on light sandy soils. As a Hardy Annual, Nigella can be sown in autumn, August to September or in late winter, February to March for an earlier flowering next year. Sow either directly as below in mild or sheltered areas or, for overwintering sow in pots. Use small pots containing moist seed compost and cover with a very fine sprinkling of compost or vermiculite. Keep the surface of the compost moist but not waterlogged. Overwinter plants in cool, light, frost-free conditions before planting out about 20cm (8in) apart the following spring. Prepare the ground well and rake to a fine tilth before sowing. Mark the sowing areas with a ring of light coloured sand and label if sowing more than one variety in the same bed. Sow thinly, once temperatures reach around 15°C (60°F). Seeds germinate in 10 to 14 days. The seedlings will appear in rows 6 to 8 weeks after planting and can be told from nearby weed seedlings quite easily. Thin the seedlings out so they are finally 20cm (8in) apart. Compost should be kept slightly moist, but not wet at all times. Sow from spring through to late summer. An autumn sowing can also be made in sheltered areas for earlier flowers the following year. Planted it in the autumn it will send down a taproot and form a rosette of feathery leaves during the winter. As temperatures warm up in spring, flower stalks shoot up. Feeding is rarely needed but organic plant food (comfrey or nettle tea) can be applied as growth begins in the spring. If it's a dry spring, give the plants water and they will grow large and erect. Without water the plants tend to flop over. At the end of the season a few plants can be left to die down and self-seed. Others can be pulled up, the seed harvest and plants composted. Seeds can be harvested from late summer and stored for use throughout the year. Harvest by placing the pods in a paper bag; allow to dry out completely, then rub the paper bag in your hands to release the black seeds. Next cut the corner of the bag and retrieve the seeds with use of a sieve. 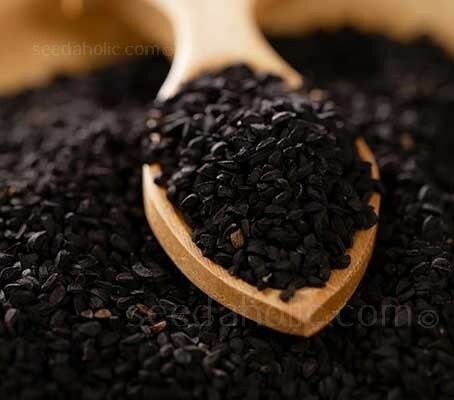 Ensure that the black seeds are completely dry then store in an airtight container. While that spice rack adjacent to the stove may be convenient for storage and access, it can prematurely destroy the potency of your harvest. Store seeds in the freezer, since exposure to light and heat releases the spice's volatile oils, which, in turn, removes the sought-after fragrance in any spice. Nigella seeds are known to repel certain insects and can also be used like moth balls. The seeds are used in Indian medicine as a carminative and stimulant and is used against indigestion and bowel complaints. Nigella sativa is native to western Asia where it grows both wild and cultivated. It is also cultivated in India, Egypt and the Middle East. The name nigella derives from the Latin nigellus, or niger, meaning black. The name comes from the diminutive of the feminine Latin word nigellus for black, because of the hundreds of tiny black seeds this genus of plant produces. The species name sativa (sativum, sativus) means 'that which is sown,' indicating the plant is a cultivated one, sown as an edible crop. Nigella sativa is commonly called Black cumin, Nutmeg flower, Blackseed, Black caraway, Fennel flower and Roman coriander. Often called Onion seed (German Zwiebelsame, Finnish sipulinsiemen) the name refers to the similarity with the seed of onion plants, however, true onion seeds are tasteless and cannot be used as a spice. They are called Fennel flower and Roman coriander due to similarity of the feathery foliage on these plants.